We offer a variety of services to help Women to Learn-Laugh+Grow together. We will always work with other organisations and businesses to bring our members new and fun things to benefit and enrich their lives. So!! our first summer 2018. We got to plant many many seeds and for a while were able to see them grow into shoots. New life appeared in the pond and sweet peas filled the air with the most amazing scent. Unfortunately the weather - whilst lovely to have - meant we lost lots of the planted crops and struggled to even be on the allotment for any length of time. We did however manage to create a smaller- more practical herb garden- prepare the land for the SHE shed and pave the patio at the far end of the plot (this will enable us to sit in some shade next summer). Our lady loo is almost done, just need the straw bale and then we can sit the loo seat on top. Our next addition to the allotment is to have the first SHE SHED in Suffolk - try and say that quickly, its hilarious - We have recently been given funding to purchase the shed from a local charity who provides support to Women survivors of Domestic Abuse. This is fantastic news as it will be the beginning of a new chapter. 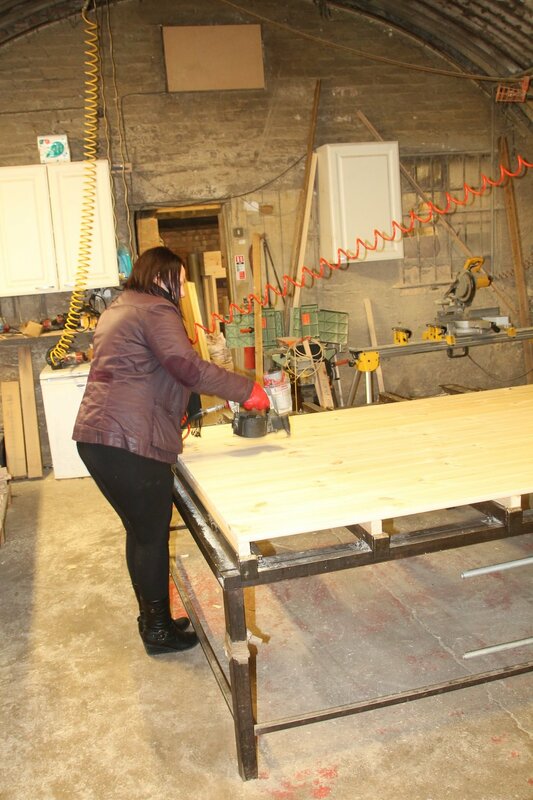 We aim to have the shed erected later this year -2018- A base for the Garden Angels to be able to sit and create items for other Women to have in their gardens. We'll also be able to sit in there with a mug of hot chocolate and watch the world go by - EXCITED! The SHE Shed will be a base for the Garden Angels, these Women who can help others to tidy their gardens by clearing weeds + pruning back plants, just the basic stuff to help make the outside space of women's homes a place to be happy and/or content. If you would like to become one of our first Garden Angels please drop us a line and we'll help connect you with a woman in need of your help. OR are you a woman with a garden that needs attention? again drop us a line. Our first SHE shed landed on - of all days - FEB 14th. The sun shone and the birds sang (they do everyday on the allotment but this day they sang louder than ever) because like us, they were SO happy to see this amazing site. We can now start to kit her out to be ready to welcome all the women who are just dying to come and have a cuppa and help cultivate the land. We’ll be opening the allotment up at least once a week for women to join us but as the weather isn’t always reliable, we won’t have set days for these sessions. You’ll need to check out the weekly detail on our Facebook page (that you can access at the top of the page) And that’s where we’ll be putting pics to show you how we’re getting on.